Most technology we use on a daily basis goes through rigorous enough product testing to prevent injury. But safety warnings and manuals can only go so far. Some tech products are more likely to cause injury than others, whether due to defective manufacturing or to being inherently dangerous enough to require careful handling. These gadgets have been deemed potentially unsafe in certain situations, and in some cases have ended up being recalled in mass quantities. For a simple bit of office equipment, irresponsibly-handled laser pointers can have serious consequences – from eye injuries and burned skin to vision impairment of the pilots and drivers entrusted with the safety of their passengers. The power limit for laser pointers is 5mW, at which point a person can blink and turn away from the laser before suffering injury. “Even this is not strictly safe for direct, purposeful viewing of the beam and the beam should not be directed at anyone’s eyes,” says a spokesperson from the Food and Drug Administration (FDA), which oversees laser safety standards. Laser pointers with much higher power output aren't hard to buy online, however, despite being classed by the FDA as causing immediate skin and eye damage when viewed directly. Blue and violet lasers can be particularly dangerous because human eyes are least sensitive to these color frequencies. “If you see a bright blue or violet laser beam with brightness similar to a green laser, you can safely assume that the blue/violet laser light is far more powerful and looking directly into the beam will cause severe and immediate eye damage,” says the FDA spokesperson. Potential damage isn’t confined to unlucky individuals caught in lasers’ paths. 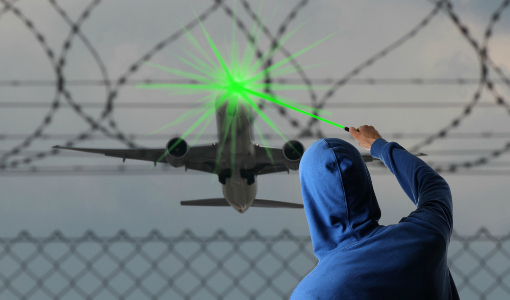 Laser pointers that are directed into the sky can distract or temporarily blind pilots of passing aircraft. 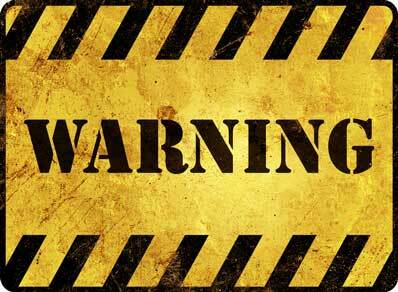 According to Laser Pointer Safety, such “laser strikes” occur around 10 times per night. When a laser beam hits the windshield of a plane, it can diffuse into a glow that impairs the pilot's vision. A laser beam that strikes a pilot's eye can also cause flash-blindness or blurry vision. Last year, the Federal Aviation Administration reported nearly 3,900 such incidents, with one police pilot reporting that he had been hit by lasers more than 100 times during his 22-year career, suffering permanent eye damage. Between 2009 and 2013, the Consumer Products Safety Commission received 2,900 reports of young children swallowing magnets. Such incidents can have deadly consequences when the magnets are swallowed in pairs – particularly with the increasingly high-powered magnets available in certain toys. One such toy, the Magnicube, can contain hundreds to thousands of super-strong rare earth magnetic balls that stick together in cubes and spheres. The CPSC filed a case for the Magnicube’s mandatory recall after several incidents in which kids swallowed the magnets. Many cases required surgery due to the magnets attracting each other inside the digestive system, pulling parts of the intestines together and leading to tearing in the bowels. A Colorado company, Zen Magnets, continued to sell these recalled magnets and is now facing an injunction from the U.S. Department of Justice. Injuries incurred while playing a rousing game of virtual tennis or boxing on Nintendo’s Wii consoles are common enough that doctors have coined a term for the condition: Wiiitis. According to a 2014 study on Nintendo-related injuries, the game Wii Sports caused 34 out of the 39 injuries that gamers self-reported on a dedicated site, with tennis being the most injurious virtual sport. 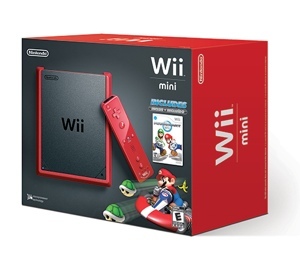 Reported Wiiitis symptoms include acute muscle pain in the arms, arm swelling, neck pain, as well as carpal tunnel syndrome in one woman who played Wii bowling six to eight hours daily for 10 days. Injuries aren’t confined to the muscles either, as people have suffered internal bleeding, strokes, and bone fractures thanks to overenthusiastic play. Luckily, compared to the millions of Wii units sold, reported injuries are few and, all things considered, easily avoided by remembering to take a break. According to the CPSC's most recent data analysis, lawnmowers caused more than 80,000 of the injuries that had to be treated in an emergency room in 2012. They’re the most common cause of electronics-related injury, followed by power saws and TV sets. No wonder, then, that the CPSC cracked down on power-tool manufacturer Black and Decker, which recently agreed to pay a $1.575 million penalty for knowingly selling defective electric lawnmowers between 1998 and 2006. The lawnmowers either did not turn off reliably or would spontaneously start despite the safety key not being engaged. Though wearable technology such as this activity tracking wristband came under fire last year as a potential cancer risk (a claim that has since been negated by numerous experts), the real danger was more basic: skin reactions. 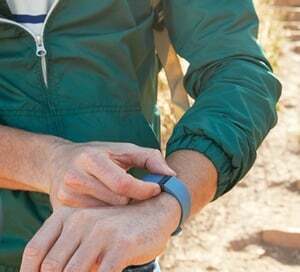 Last February, around a million units of the Fitbit Force were recalled after 9,900 users reported irritation from wearing the wristband and 250 reported blistering. The good news is that buyers got full refunds, and later iterations of the Fitbit have been reaction-free. We may be a nation of savvy smartphone users, but many of us still don’t practice the cardinal rule of ignoring the phone while the engine is running. According to a National Safety Council report, people using cell phones while driving are four times as likely to crash, a stat that's measured by comparative rates of emergency room visits and property damage caused by crashes. The same report estimated that based on crash figures for 2013, over a quarter (27%) of crashes involved drivers who were talking or texting on a phone. That's two million car crashes that were likely to have occurred because the driver was distracted by a phone. Hands-free sets aren’t necessarily a safer option, despite being a legal one. Drivers on hands-free calls have been found to be as distracted as drivers clutching their phones to their ears, with reaction times slower than someone driving at the blood alcohol limit of 0.08 percent. During such testing, if conversations were complex, drivers' reaction times became significantly longer.